The Xperia L runs on Android 4.1 Jelly Bean, on paper the same firmware ticking inside the latest Sony flagship, the Xperia Z. There are some differences and lacking features but the overall experience is quite similar. The back-end software optimizations, combined with Project Butter, give you as smooth a ride throughout the Xperia L UI as you can expect thanks to the powerful dual-core chipset and graphics. 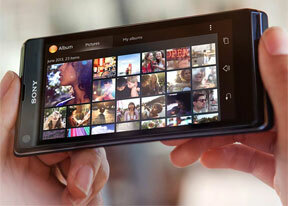 Here is a demo video of the Xperia L in action. Sony has also updated its custom launcher to go with the new Android version it runs on. The Xperia L gives you the option to change the number of homescreen panes (by adding more or removing any of the default 5) and even select any of them as home. You can't have more than seven panes at any given time though, nor can you change the order they're in. Also the background of the on-screen buttons is no longer gray and is much better looking in black now. Adding stuff to the homescreen is done with a tap-and-hold on a blank area of a homescreen or using the pinch zoom out gesture. A context menu appears, allowing you to perform various customizations on your phone - add widgets or shortcuts, change the wallpaper and the theme. You can also add shortcuts from the app drawer by holding your finger over an icon and dragging it across to the homescreen area. The Xperia L has a few custom-made Sony widgets for various social services, connectivity toggles, the Walkman player, etc. The Timescape and Mediascape widgets are gone for good. Unfortunately, the widgets in the Xperia L do not resize or re-arrange automatically when you're trying to place them, even though Jelly Bean supports that feature natively. The wallpaper menu offers both static and live wallpapers. As usual you can preview the live wallpapers before applying them. Selecting a new theme changes the lock and home screen wallpapers and the color of the system icons (toggles, menu icons, etc.). Depending on the theme you've chosen, the LED strip below the screen will light up in matching color. There is no overview mode like with previous Sony Xperia smartphones. Instead, you get the homescreen edit menu when you do the familiar pinching gesture. Along the bottom, there are five docked shortcuts (the app drawer shortcut and two on each of its sides). These are visible across all homescreen panes and are user configurable: they can be either single icons or folders with multiple items in them. You can also place whole folders there in which case you get smaller icons of the first four items in them. The lockscreen has been redesigned too. It uses cool new default animations and has two shortcuts for quick access to the camera (swipe to left) and to the dedicated music controls (swipe right). The hardware shutter key actually makes the camera shortcut redundant - it will launch the camera even if the device is locked. When the music player is active, the lockscreen will show the music controls by default, but you can hide them with a swipe if you want. You can also enable Face, Pattern, PIN or Password unlock, in ascending order of security. The standard notification area is also present, and now features a few toggles switches (Sound, Bluetooth, Wi-Fi and Mobile Data). There's also a quick shortcut to the settings menu. The app drawer is organized in pages and you can sort the apps manually, alphabetically, by the most used or most recently installed. If you tap and hold on an app a green Add to Homescreen area will appear on top of the app drawer. Just drag the icon there and you will go back to your homescreens where you can put a shortcut. The task manager of the Sony Xperia L is the same as on pure Android. It lacks the small apps and doesn't come with a "kill all" option. You can only swipe thumbnails to either side to remove the apps or select a thumbnail to be taken to the respected app. The Data usage system service is onboard too. It also lets you set a limit for network data for a specific period and usage is broken down by apps.